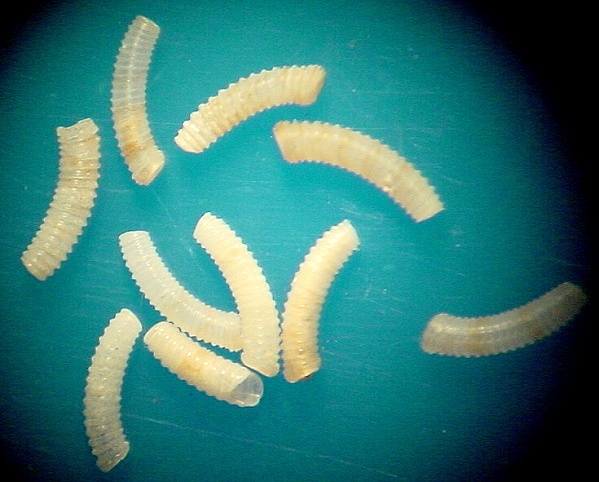 Data: These tubes are 2mm long and are from the shell grit you sent me from Kauai, Hawaii. The late Joanne Lightfoot [Lightfoot, J., 1992. Hawaiian Caecidae. Hawaiian Shell News 40(7): 1,4-5. July] clearly demonstrated "Caecum arcuatum de Folin, 1867" was an early stage of "C. septimentum Folin, 1867." The specimen Kay illustrated was a partially-developed third stage with an adherent second stage - making it a sort of "hybrid" - and unusually long. The excellent photo of your shells clearly indicates this species (all are third stages). So which of the two names the de Folin coined is the proper one to use? Well, I went to my dog-eared photocopy of the works of the Marquis de Folin, most of which is a series of publications entitled Fonds de la mer. This work was issued in irregular installments between 1867 and 1887. To say the bibliography is arcane and confusing is a gross understatement. The original description of Caecum sepimentum [note spelling; the species epithet is a noun meaning "fence" and has nothing to do with "seven" as Joanne's mis-spelling suggests] was probably in 1867 and is on page 84 of the "Tome premier." The Marquis considered it unusual that the mucro, the pointed feature on the posterior aspect (septum) was lacking on his shells. The illustration is well-drawn, as de Folin was inclined to do - about four inches in length (vs. the 2 mm. shell). It is clearly conspecific with your shells. The type specimen came from Mauritius. I cannot find any mention of "Caecum arcuatum" in the Fonds until the fourth (final) "Tome." I have dated this work as "1881-1887" On page 24 Caecum sepimentum, var. arcuata [sic] appears; it was collected off Tahiti. It was not illustrated, but the text indicates it was "plus courte et plus courbée" - the condition of an early shell stage. In a passage just before that the author mentioned receiving C. sepimentum from Honolulu. I think the name Caecum sepimentum de Folin, 1867 clearly has chronologic priority over the synonymous C. arcuatum de Folin sometime between 1881 and 1887. I believe both Kay and Lightfoot had the date of publication for C. arcuatum incorrect. Thus the proper name for your shell is Caecum sepimentum de Folin, 1867. In Hawaii the following three caecidae have these transverse rings. Caecum arcuatum would most likely be what you have. C. arcuatum:(deFolin, 1867) Length 2.75 mm. diameter 0.5 mm. Shell: tubular, slightly curved and tapering toward the apical end: ringed by about 20 strong, regular, slightly keeled transverse rings separated by interspaces of about equal breadth and depth; aperture slightly flared with 2 or 3 smaller rings; septum flat with a feeble bulge in the center. Color: yellow brown, often white toward the apical end. Common in tide pools and on solution benches and occasionally found in sediments to depths of 20m. Uncommon; found occasionally in sediments in tide pools and to depths of 8 m.
Uncommon found in sand in depths of about 30 m.